Practice cancelled for tonight—not enough ringers available. 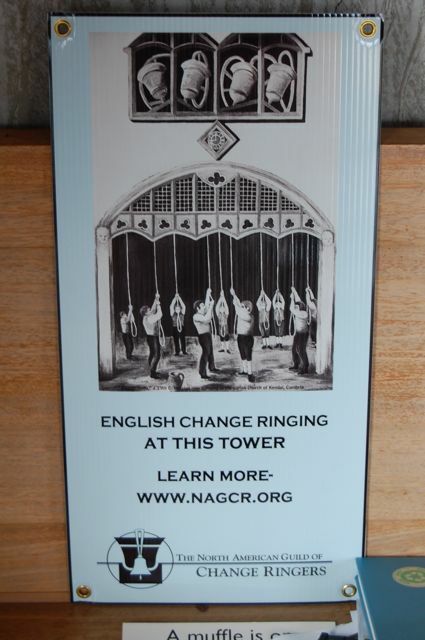 Four ringers for service ringing today: Jim, Judy, Marguerite, Thomas. Today was the first time the treble has been rung by the band since 2008, so we made sure the treble was part of each group of bells we rang. The band was composed of relatively advanced ringers, so we focused on Plain Bob today. Rounds and Call Changes (F-E-D-B♭, a modal sound). Marguerite called. Plain Bob Minimus (F-D-C-A, then F-E-D-C). For part of the time, each ringer called out “Leading” as he or she moved into leads, to help solidify the band. We stood as necessary to consult the wall chart and talk over what was happening. In the future it may help to call out who is dodging, as many of us just count our places and so the dodges are not always cleanly struck. Rang down in peal (attempt), 135 then 246. Each week we get a little better. 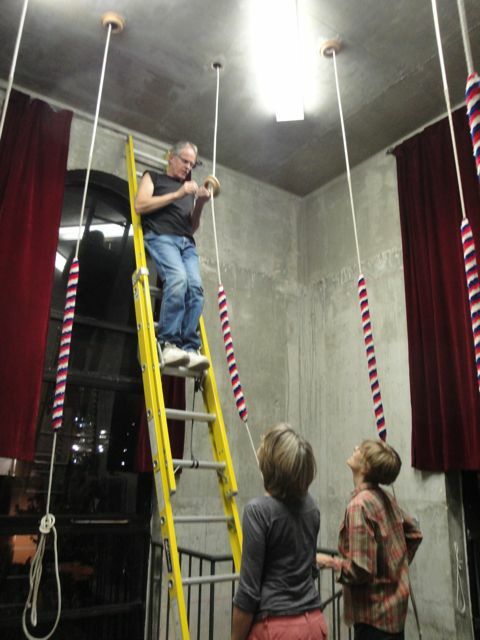 Today Thomas and his daughter used the ladder to replace the treble’s rope boss, and rang the treble. It was the first time the treble has sounded since 2008. Audio below. 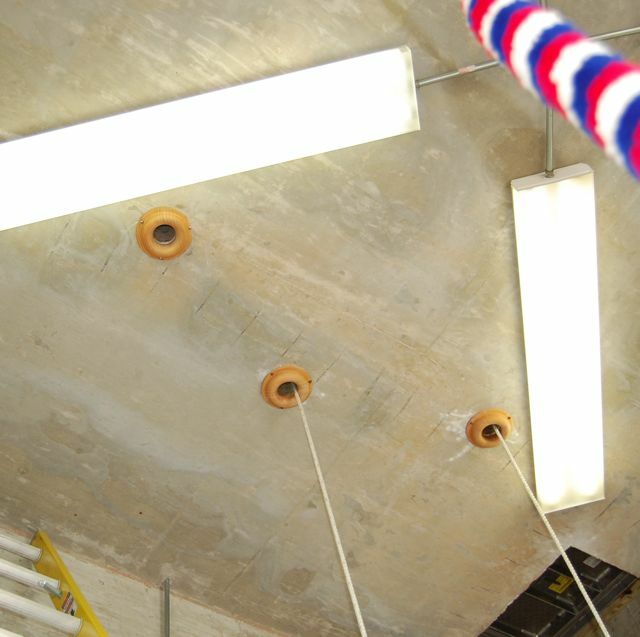 Now that the extension ladder is up in the bell chamber, many more repairs are possible. One such is the replacement of the repaired rope boss for the treble. Over the past weeks, a strip of oak had been glued in place of the broken section and shaped to match, and the bottom of the boss was sanded flat again to remove the warp caused by water coming down from above. Plastic screw anchors were inserted in the ceiling today in place of the original lead strips, and the rusted screws were replaced with stainless steel. 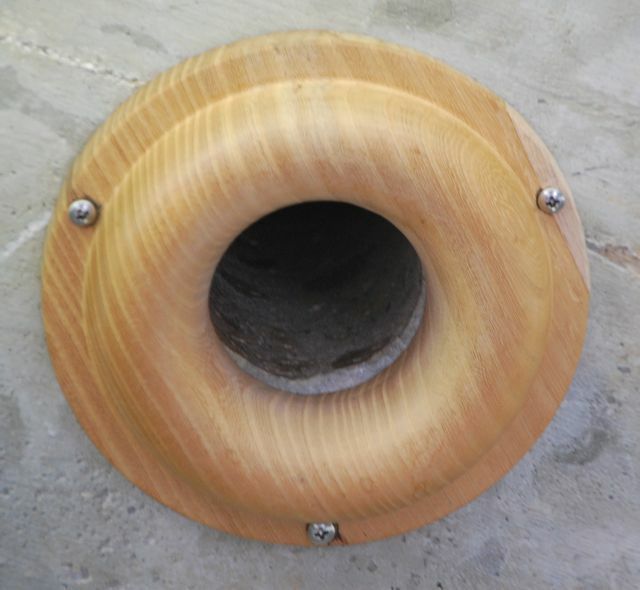 Further work may be needed to align the boss perfectly with the hole in the ceiling, as the warping moved the screw holes in relation to the rope hole. The treble is once again ringable, and we have eight bells at our disposal! What looks like preparations for repair of some broken stucco on the tower stairs has begun. Someone has cut back a section of damaged stucco and some concrete underneath that was cracked by the rusting reinforcing rod within. 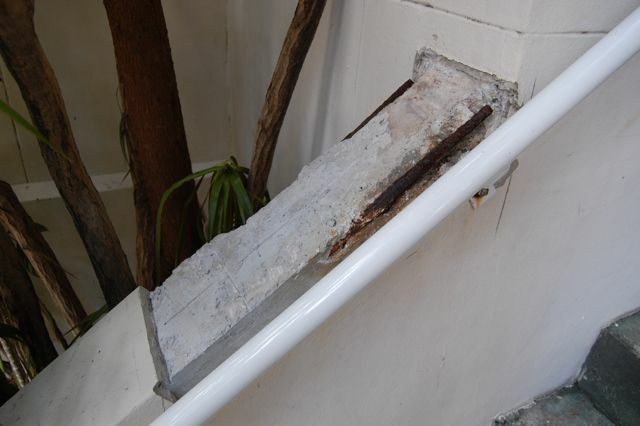 Iron expands when it rusts, and when the reinforcing rod rusted it expanded and cracked the concrete around it. Presumably the rusting steel will be removed and everything patched up again. Four ringers at practice tonight: Judy, Ken, Marguerite, Thomas. While the 5 was being rung up, its rope boss (already loose) loosened visibly … read on to get the story. Plain Hunt on Four (D-C-B♭-A) to get everyone warmed up. During this ringing, two of the three screws holding up the 5’s boss came out, and one fell to the floor. 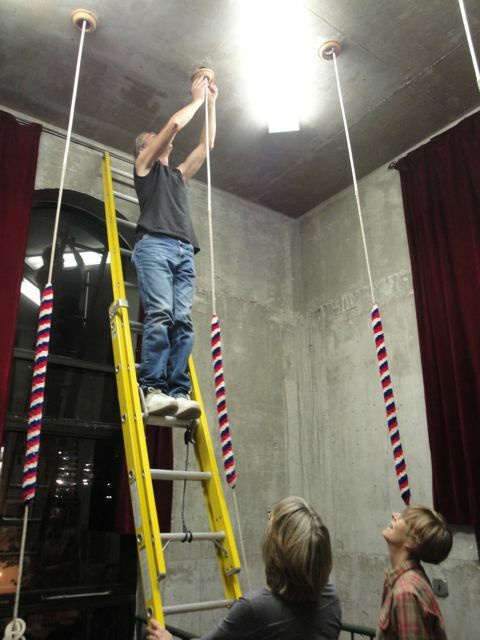 Thomas lowered the 5 (B♭) carefully, and Marguerite raised the 2 (E), so that we could continue ringing without damaging the 5’s rope. Plain Hunt on Four (E-D-C-A). This group of bells gave a minor-scale result, with the ringers joking that we sounded like something from Porgy and Bess (“Plain Hunt, you is my method now …”). We worked on getting everyone aware of the coursing order and using it to keep track of which bell to follow next; getting the striking clean enough to, for example, clearly hear back rounds when we got to that row; and then on getting the striking as well placed as we could. Placing practice, Marguerite conducting (E-D-C-A). She put us through each adjacent pair placing (“1 and 2 make places”, “2 and 3 make places”, “3 and 4 make places”), then we attempted some call changes followed by making places. We finished up with some more Plain Hunt on Four (E-D-C-A), to wrap up practice on a positive note. Rang down in peal. Each week we do a little better; this week we got a bit scrambled in the middle but were able to get back into rounds and finish together. Well done all! After practice, the band was full of energy and optimism. We decided to bring the tower extension ladder up into the ringing room as a first step in replacing the 5’s rope boss. It was an adventure. First we had to get the ladder out of the downstairs room and onto the stairs. We tried getting the ladder up the spiral staircase but it wouldn’t quite fit. So we disassembled it, sliding the two halves apart, and took them up individually. The inner ladder threaded up the spiral without incident, but the outer ladder was just too large to make it around. Ken had the inspiration of removing the metal plate in the floor at the top of the stairs, an act of genius, after which he threaded the outer ladder up through the opening where the plate had been and we replaced the plate. In the ringing room, the four of us reassembled the ladder, which was a job in itself since it hadn’t actually been designed to come apart. Thomas’s ringing bag of tools proved essential. We then opened the curtains so the ladder could rest against the concrete walls, a challenge since the curtains are hung from plain rods 14 feet up. Ken swarmed up the ladder and reported that the “anchors” (curled lead strips) for some of the boss’s screws had gone missing. Thomas had some plastic anchors on hand; Ken used them to put the boss up again. The 5 was back in business. We were on a roll. Ken tightened the screws on the other six bosses, with the other three of us helping move the ladder, shifting the curtains, and steadying the ladder. We would have replaced the treble’s boss but Thomas had it at home repairing the break; soon. Ken also made the excellent suggestion that we replace the plain curtain rods with traverse rods, mounted lower on the wall so they blocked more sun and were easier to deal with. Well done, Ken! And well done, all. Second class for new ringers, and first class for new ringer Anne. Barbara and Eoin were unable to attend. Anne made excellent progress, getting as far as catching the sally and pulling single handstrokes. We welcome new ringer Anne! Her first class will be 2011Nov21.